“Me” Time can be disguised as family time. Allow me to share with you my personal case study. 1. Reading… My children have between 30 and 45 minutes of reading to do a night so I often ask them to save it for when I’m home from the office. After dinner, my son and I will curl up on the couch and silently read our books, cuddling under a shared blanket. 2. TV… Now I would never do this with Housewives, Mad Men or Scandal, but pick a TV show that you love (one that can sit for days on the DVR) and use family time to share it with your children. For us, that show is American Idol. I save these episodes for Friday nights and weekends where we gather on the couch and enjoy. I snooze in and out of the program while the kids snuggle with me, laughing and enjoying the program. And Idol is loooong. Use it to your advantage. Talk about delicious ‘me’ time! Life doesn’t get better than this. Lemons make the world go round! It’s the most beautiful workhorse I know. Just thinking about them puts a smile on my face. 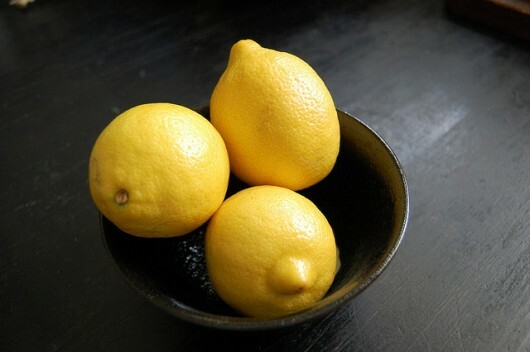 I use lemons as household décor (throw a ton into a bowl for a quick and easy centerpiece) and as a health aid. I learned in French Women Don’t Get Fat that hot water and lemon juice – aka the citron presse – help cleanse the body. My favorite tip? It will mask almost any culinary catastrophe! Fresh lemon juice squeezed on the dinners I prepare (or your favorite microwave meal) turns it from simple to superb. I work in morning TV, which means I often leave the house before the crack of dawn (and my eyes haven’t quite woken up before I’m out the door). Eve Pearl’s Salmon Concealer is my secret to looking more alive than I often feel. It is a spackle for the eyes without feeling cakey or gross. Another reason why I love the product: Eve and I met working in television, but she left that world to start her own line of cosmetics. I admire any woman who takes a leap to chase a dream, especially Eve, because she’s not only a businesswoman I admire, but a friend. Follow her on Twitter at @todaysmoms and @shttymom. Join her on Facebook at Today’s Moms and Sh*tty Mom.